I think it's so great that my daughter loves creating as much as I do! We're always crafting together, and she wants to make her own version of whatever I'm doing. 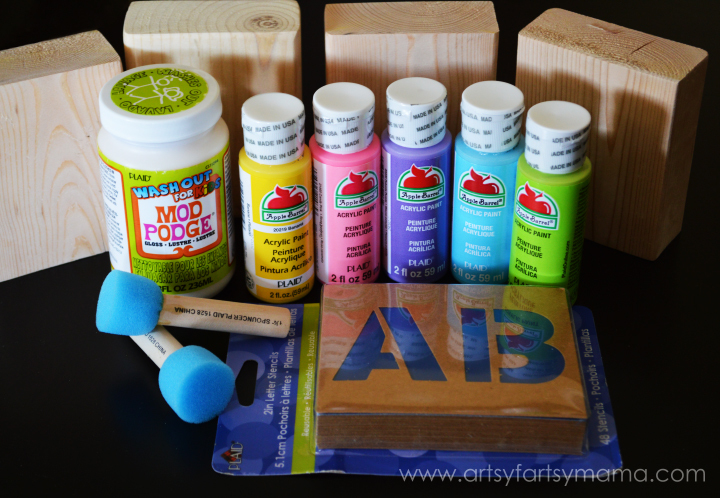 Plaid Crafts sent some new Mod Podge Washout and Apple Barrel paint to create with, which are perfect for kids crafts since they are both washable. Speaking of washable - the Mod Podge Washout for Kids is quite similar to regular Mod Podge, except for the fact that it is washable - even when dry. That includes being machine washable with no pre-soak time. That's a win for a mom like me who has a creative toddler, and is afraid of what kind of mess I'll have to clean up when we're done. Step 1: I lined the table with butcher paper and got out a bunch of sponge brushes. This was her project, so I left it up to her decide which colors to paint. She painted everything except the bottom of the block (easier to let stand and dry), then moved on to the next one with a new brush. Once all the blocks had their first coat, we went back to the block she started with and gave them all a second coat. The pink and the yellow could have used a third, but they still looked great. I love the colors of these Apple Barrel paints. They are so bright and fun! Luckily, we didn't have too many paint accidents. She got some on her hands and a drop on her shirt, but the Apple Barrel paints are washable while they're still wet. We also kept some baby wipes on hand which took the paint right off anything that was spilled on. Step 2: Once the blocks were dry (which didn't take long at all), I punched out the stencils (you can see that the "N" is still intact) to spell her name. 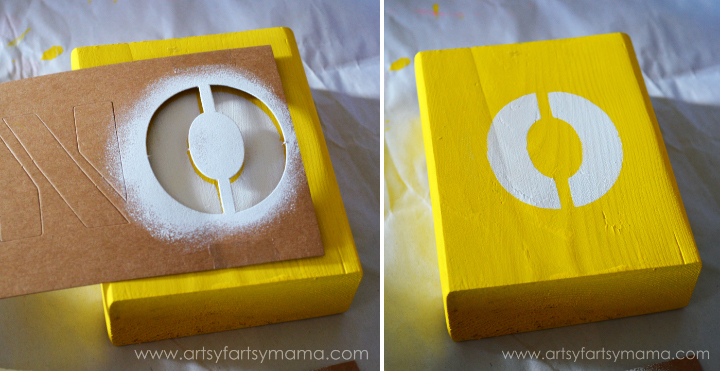 I tried to center the stencil on the block and taped it in place. I showed Zoey how to use the spouncer and practiced on our paint tray before painting on the block. She wasn't feeling very confident about it, so I held her hand and helped her paint over the stencils. Needless to say, she was quite impressed when we were done. Step 3: I was just going to have her seal the blocks with the Mod Podge when she asked, "Mom, aren't we going to sparkle them?" I wasn't planning on it, but apparently she has noticed my infatuation with glittering a lot of my projects... So, of course, I obliged. I poured a small amount of the Mod Podge Washout into a container and added a bunch of iridescent glitter. Then, I stirred it with a craft stick and that's it! Glittery, washable Mod Podge in no time! 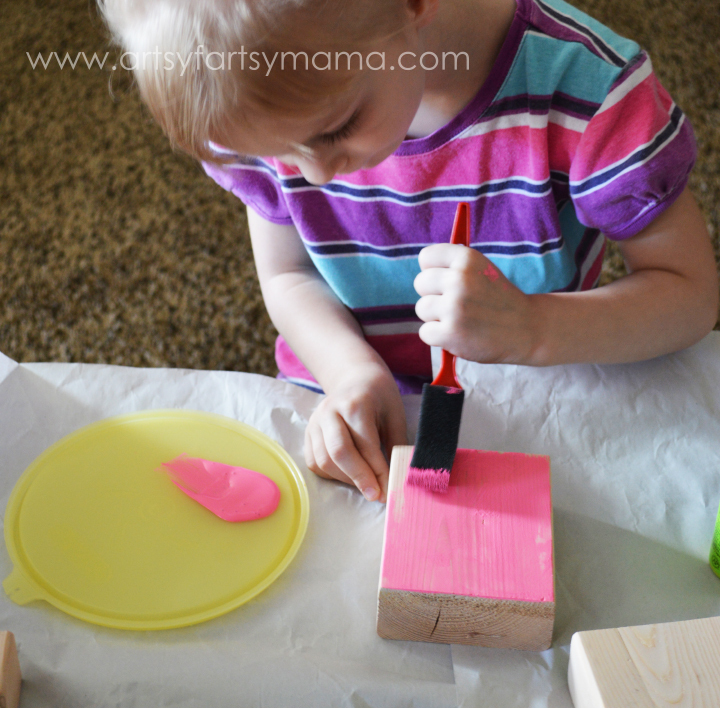 Step 4: Using a sponge brush, Zoey painted the front, sides, and top of each block with the Mod Podge. This Mod Podge seemed to be a little thicker than regular Mod Podge, but I think that helps when it comes to kids crafting on their own. She painted a pretty thick layer, but it dries clear. 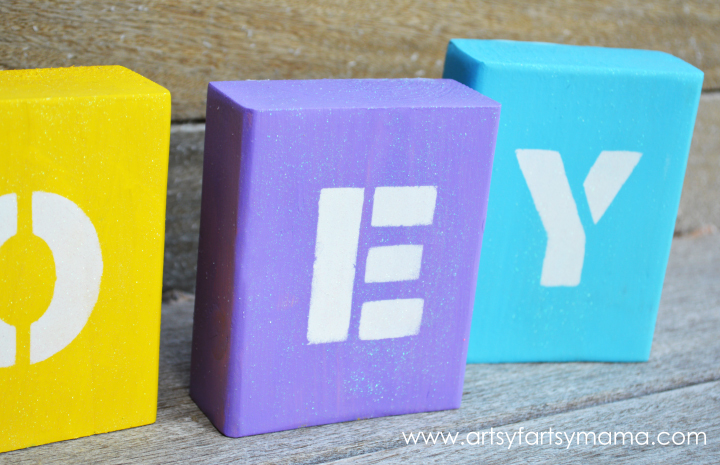 Step 5: Let the blocks dry, and you now have sparkly, stenciled name blocks! She loves seeing her name up on the shelf and is so proud of herself for making them all on her own. Any time we have company, she likes to show them off. I'm pretty impressed with how well they turned out, and we can't wait to create more projects in the future with our Plaid products! 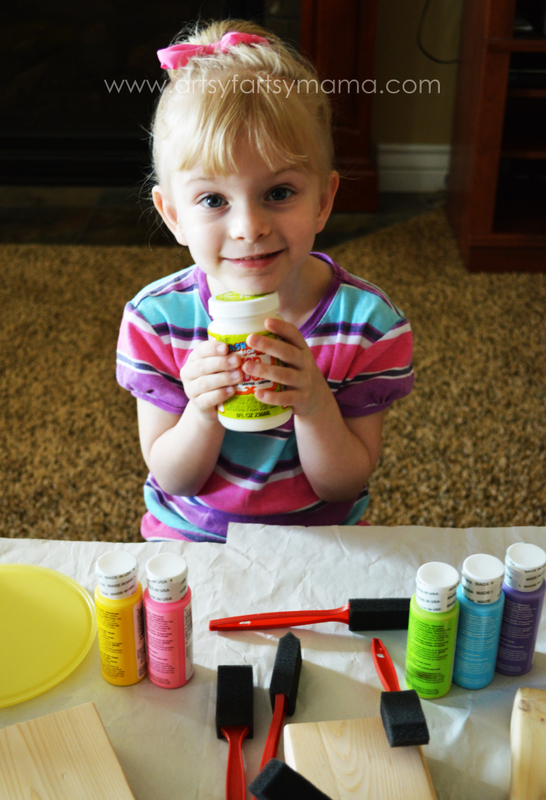 What would you create with Mod Podge Washout and Apple Barrel paints? This is SO cute! I love that she was able to help make them! Also I wasnt aware that Mod Podge made a kids version, I need to snag some of that up! I LOVE these blocks! It's been on my to-do list forever for my daughter but I think seeing how cute yours turned out, I need to do it sooner rather than later!! What a fun project for even little kids to make! I'll have to keep this in mind once school is out for the summer. 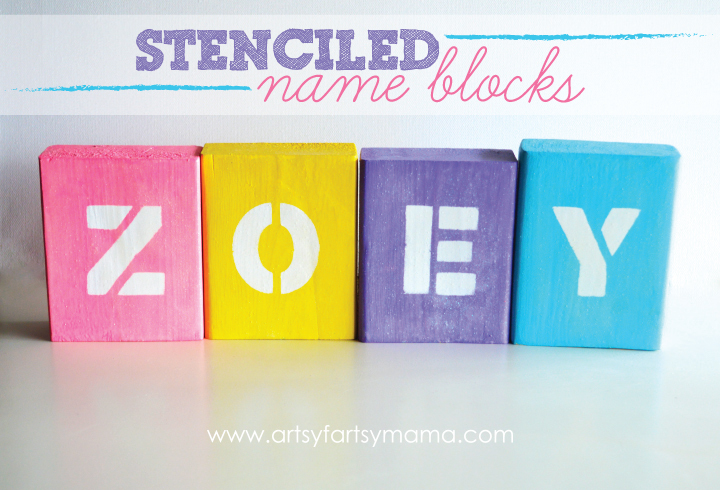 My kids would love to have their names on blocks for in their rooms! Oh my gosh she's adorable! LC would love this project!! glad i'm not the only one that uses tupperware lids as paint trays! ;) cute project and cute little girlie. How cute is that!!!! Love them Lindsay! Goodness! These are just adorable! 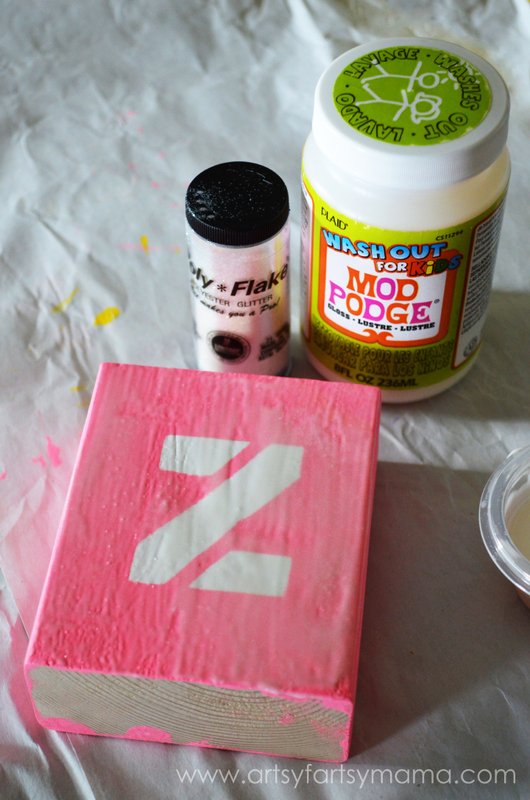 Love the idea of wash-out Mod Podge. I love to do these kinds of crafts with my young Granddaughter and this would be a plus for sure! Cute! 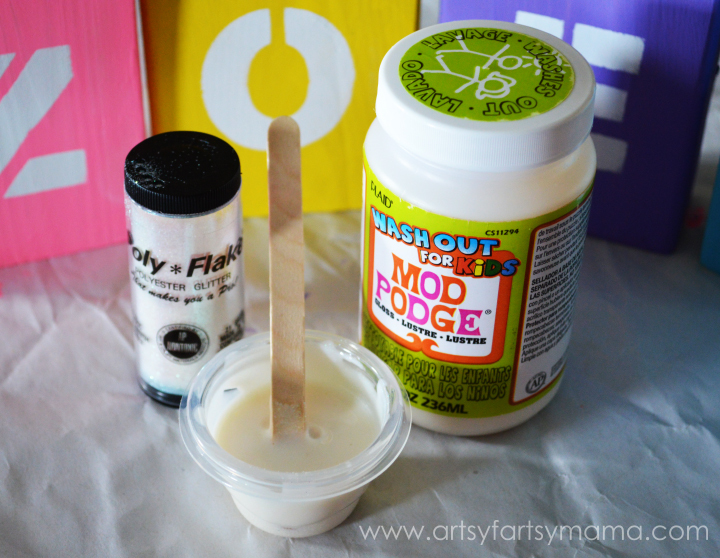 I didn't know about the Kids Mod Podge--cool product! What a great project! My son is learning his letters, and I know he would LOVE something like this! This is awesome - love the name blocks. Kids would have a blast with this!